FILE - Afghan President Mohammad Ashraf Ghani speaks during a press conference at Presidential Palace in Kabul, June 30, 2018. Despite major attacks by the Taliban in various provinces of Afghanistan including southeastern Ghazni province in recent days, the Afghan government is still considering attempting a possible cease-fire with insurgents ahead of the Eid holidays, a government spokesperson told VOA. “Recently, the Afghan president had many consultative meetings [about possible cease-fire] with representatives of various fractions of the Afghan society. The issue of cease-fire is under review and we will announce the decision when we get to a conclusion,” Shah Hussain Mutrazawi, a spokesperson for Afghan President Ashraf Ghani, told VOA. Murtazawi added that the cease-fire is part of a larger quest of the Afghan people, who demand peace and an end to violence in the country. He did emphasize, though, terror groups that resort to violence would be dealt with decisively by the country's security forces. Meanwhile, the Afghan Taliban also reportedly are considering a new four-day cease-fire during the upcoming Eid holidays. Two senior members of the Taliban, who spoke to Reuters on the condition of anonymity, said their “friends” advised them to announce the cease-fire. 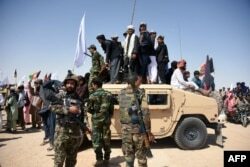 “As usual there would be divided opinion on a cease-fire like we faced last time during Eid-al Fitr but our supreme leader Sheikh Habitullah Akhundzada would then play his role and would either announce the cease-fire or may ask the fighters to continue their fight,” a member of the Taliban leadership council told Reuters. In a televised address on June 7, Ghani, in an unprecedented move, announced the unilateral week-long cease-fire with the Taliban ahead of the holidays in June of this year, which was followed by the Taliban’s announcement of a three-day cease-fire. Afghan Taliban fighters roamed around cities across Afghanistan and celebrated the Eid festival with Afghan soldiers and civilians. Taliban fighters were seen taking selfies with Afghan security forces. In this photo taken on June 17, 2018, Afghan Taliban militants and residents stand on a armoured Humvee vehicle of the Afghan National Army (ANA) as they celebrate a ceasefire on the third day of Eid in Maiwand district of Kandahar province. In the latest spike of violence, Taliban insurgents have been fighting with Afghan government forces in Ghazni province for the past five days. So far, 70 Afghan police officers, 30 Afghan army personnel, more than 30 civilians and over 300 Taliban insurgents have been killed, Sayed Ghafoor Ahmad Jawid, a spokesperson for the Afghan Ministry of Defense, told VOA. “Ghazni city is under the government control. Clearing operations are underway outside of the city. Afghan and international humanitarian aid, including medication and food supplies by the Red Cross International Committee, are on their way to Ghazni province,” Jawid said. Ghazni is a strategic province due to its geographical location. The province connects the capital city of Kabul to Kandahar, another major province in the south of the country. The province also is a historic city, and was the capital of Ghaznavids Empire several centuries ago. The Islamic Educational, Scientific and Cultural Organization (ISESCO) named Ghazni as the capital of Islamic culture in the Asian region in 2013. 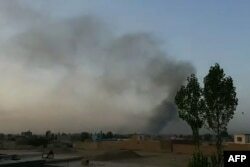 This screen grab taken from AFPTV video on August 10, 2018 shows smoke rising into the air after Taliban militants launched an attack on the Afghan provincial capital Ghazni. Some analysts charge that the reason why Ghazni is the scene of fierce fighting between the government and the insurgents is because the province lacks the necessary security measures and is therefore susceptible to attacks. Abdul Karim Matin, former governor of Ghazni province, said one of the reasons why the Taliban easily could infiltrate the province is because it lacks what he called a “security belt” that could defend the province. “Another reason for the Taliban's infiltration in the province is the limited number of troops. Our current force is based on a 17-year-old force structure that cannot meet the current security threats,” Matin told VOA. “We cannot win this fight unless we adjust and boost our forces based on the current threat level,” he added. Despite the violence by the Taliban across Afghanistan, the country’s High Peace Council (HPC), a government body tasked with talking to them, says Afghanistan is at war, and a cease-fire is a requirement to launch peace talks and end the war in the country. “A sustained and lasting armistice is what Afghan people desire. We are hopeful to witness another cease-fire, like the one we had last Eid. To end the war and violence, we should be engaged in the peace process, relentlessly,” Sayed Ehsan Tahiri, a HPC spokesperson told VOA. “We welcome any steps toward ending the war in Afghanistan,” Tahiri added.